It’s official, I’m in a soup phase. What can I say, it’s that time of year when the thought of eating anything cold sends shivers down my spine, even though, yes, this is the mildest winter in a while. Even so, a couple months back I started warming up my cereal before eating it (cold milk? no thank you!) and cut back on green smoothies. So how to still get all the greens I want, with all the warmth I crave? Green soups. 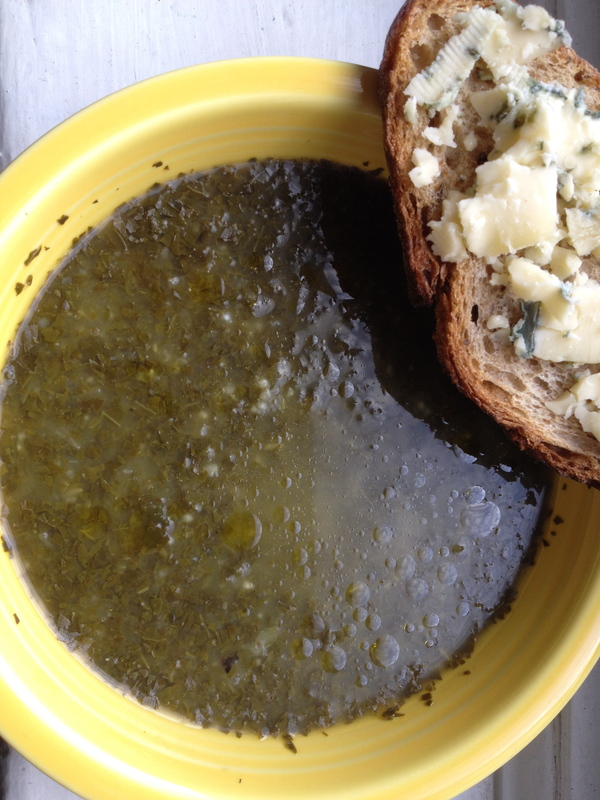 Lucky for me, Anna Thomas paved the way for green soups with her 2009 cookbook, Love Soup. She seems to be considered the godmother of green soups so I dutifully read up on her methods and set out to create my own. The basic method is you get yourself two big bunches of your favorite greens—chard, spinach, kale, collards, watercress—slowly caramelize two big onions, then add 1/4 c uncooked rice, vegetable stock, the greens, and voila. You finish it off with a bit of acidity (lemon juice, vinegar), pinch of cayenne, salt, and pepper, and puree it all in a blender or with an immersion blender. The rice, especially arborio, adds creaminess and body to the soup (so it’s not thin or watery), without using cream. Serve drizzled with your favorite olive oil and perhaps some crusty bread. I had two bunches of green kale so that’s what I made this version with, although I’d love to try with chard and collard greens. I made my own vegetable stock on the adjacent burner, although you could use store-bought or veggie bouillon if you’re short on time. 1. Heat the olive oil in a stock pot or dutch oven on low heat then add the onions. Continue to cook over very low heat, with a lid mostly covering the pot to keep in the moisture, 25-30 minutes, stirring occasionally. If the onions start to stick or turn dark brown add a splash of white wine to deglaze the pot. Meanwhile, if you’re making your own veggie stock, get this going in another pot on the stove. I use 4 c water and add any veggies I have around such as carrots, onions, celery, a bay leaf or two, black peppercorns, etc., bring to a boil, then let simmer for 45 minutes. 2. 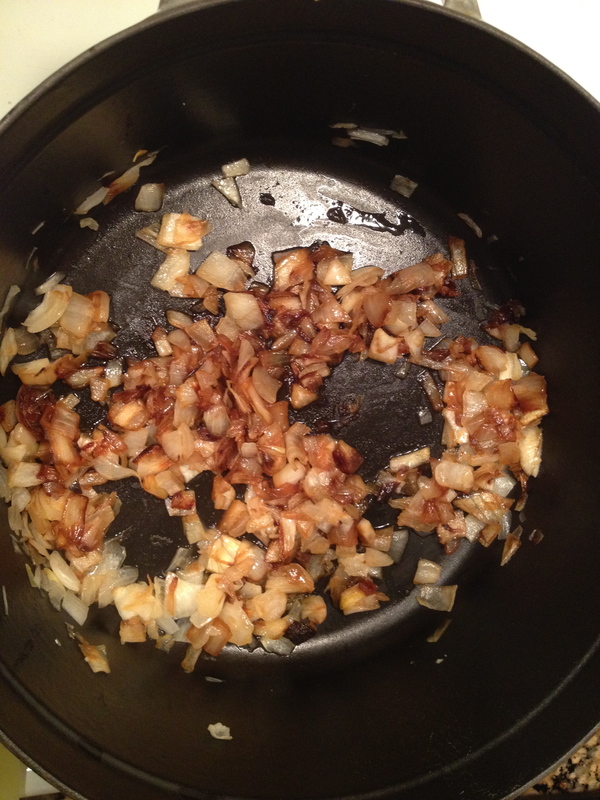 Once the onions are deeply caramelized, add the water to the pot, and the rice, and bring to a boil. Lower heat and simmer for about 15 minutes. Add the chopped greens. If you’re using spinach, add the sturdier greens first (like kale or chard), and the spinach 5 minutes later since it wilts quickly. Add the veggie broth and cayenne, and bring to a simmer, cooking for another 5 minutes. Don’t overcook, otherwise the greens become dull and lose all their wonderful color. Turn off the heat, season with salt and pepper, and add your acid (lemon juice or vinegar). 3. 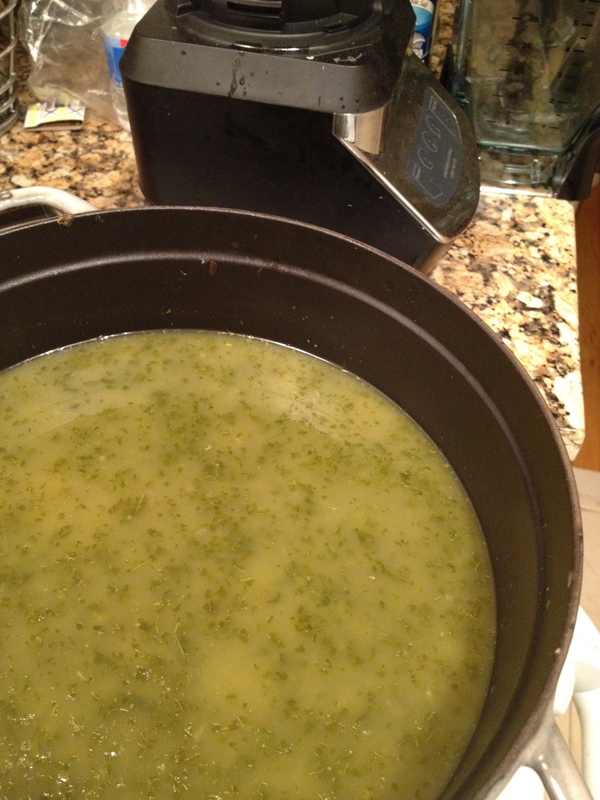 You can puree the soup using an immersion blender all at once in the stock pot, or in batches in a stand-up blender. Serve with a drizzle of olive oil and a pinch of sea salt. I like some crostini on the side with a creamy cheese or slather of butter. Look at the color of these caramelized onions! And here’s the soup, with Ninja blender in the background, which recently cost me half a fingernail while washing the blade. thanks amy! i like that blog and love the looks of that recipe.